first at all sorry me to start new discussion, but I am lost in these previews discussions because they are few years old so with old firmware too and with different conclusion. After few days trying to make working I am hopeless. 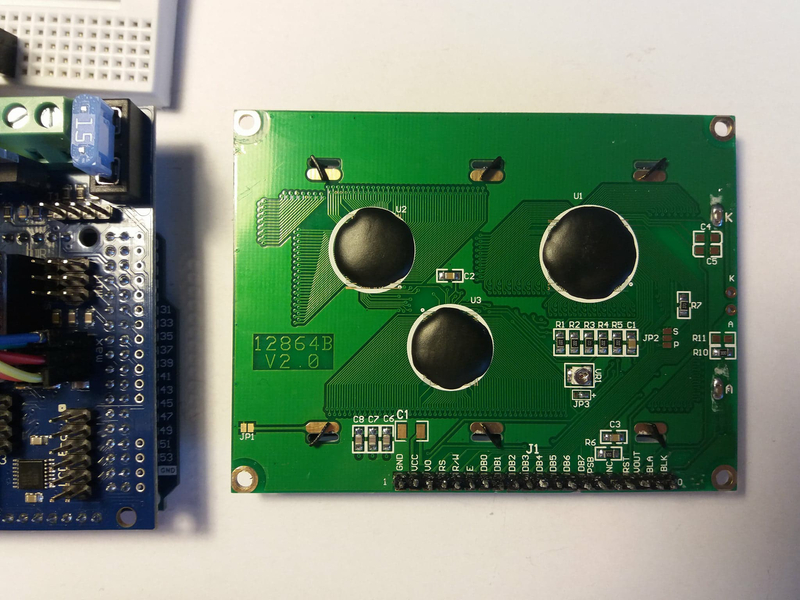 tried to connect the RepRapDiscount Full Graphic Smart Controller 128x64 directly to DU. I still believe I do something stupid because I do not want hope that Repetier firmware generator can't generate working firmware with these hardware configuration (Mega 2560 + RAMPS 1.4 + the same LCD... working perfect). After I upload the firmware, connect thermistors and the RepRapDiscount Full Graphic Smart Controller 128x64 via the schemas above, the LCD lights homogeneous collor, so at least the power supply is right (the constrast setup checked too), and beeper makes soundless noice following the blinking RX and TX leds and the LCD little changes its brightness. If I disconnect thermistors, the beeper should peeps as I set up in generator (on MEGA works) but in this assembly nothing, no peeps after push the encoder too. If I connect DUE + RADDS 1.5 + thermistors to laptop and start Repetier-Host the connecting proces works and thermistors showing their temperature. Only one success - in generator I set up Heated bed Temperature sensor pin - Temp 1 and Extruder Temperature sensor pin - Temp 0 and via the schema above a connected the thermistors and still defect in log in Repetier-Host until I checked that the schema of thermistors pinouts numbers does not respond the numbers in generator (Temp 0 responds T0, but Temp 1 responds T4). And I have to say that I still haven't tried to plug in drivers and main power supply so I expect some other difficulties. I will be grateful for any help that will lead to working this hardware. You could forget about the sd card (not sure if it could work as it requires 5V and has level shifter while due is 3.3v). Use the expansion pins to the side to connect display, not the display port. The Sparkcube graphic display does exactly this with I think the same chipset. 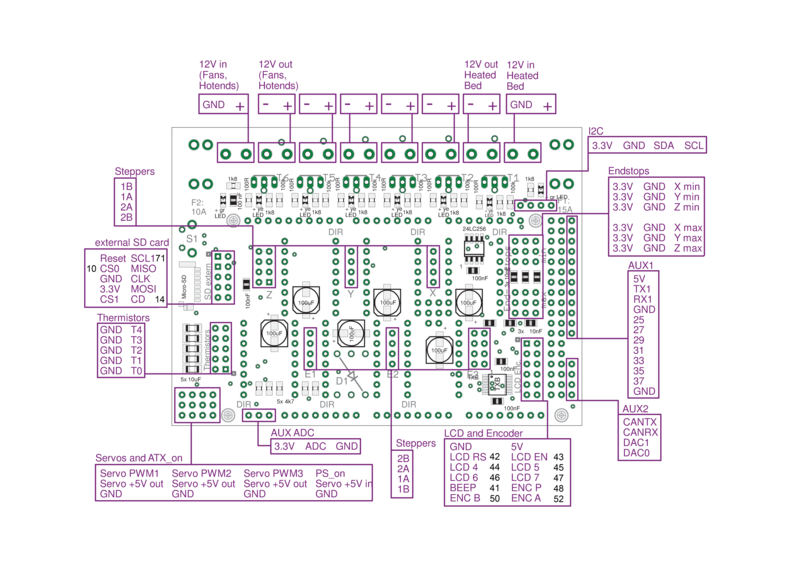 Use 5V for power and the io pins for sending being 3.3v is no problem. Will still be handled correctly. Thank you for the right direction in my working. but if I control the expansion pins with the DUE pins with beeps I found out that (and the schema confirm that https://raw.githubusercontent.com/luc-github/DUE-RADDS-GLCD/master/Images/RADDS.png ) that the pins should be: 5V, TX1, RX1, GND, 25, 27, 29, 31 and for encoder: 33, 35, 37, GND. I have two questions. What connect with? and How to configurate firmware and eventually what edit in it? Sorry I can not say which is connected where, just don't know and no time to figure that out.